Below is a list of current traffic calming projects happening in Iowa City. The ultimate goal of four- to three-lane conversions is safety: reducing vehicle collisions and traffic speeds. Conversions will be implemented in 2019 on a number of Iowa City streets, including portions of Clinton Street, Madison Street, and Mormon Trek Boulevard. Portions of Gilbert Street are also being reviewed for this treatment. A conversion was completed on First Avenue between Bradford Street and Lower Muscatine Road in 2017. The following videos shows how four- to three-lane conversions work and the benefits measured by the DOT on roads throughout Iowa. The video below is used with permission from the Iowa DOT. The goal of Iowa City’s Neighborhood Traffic Calming Program is to reduce excessive speeding and/or traffic volumes on streets. Participation in the program is neighborhood-initiated and is not imposed by the City. To find out more about the traffic calming program, view the traffic calming brochure. Current Phase: Approved by City Council on Oct. 2, 2018. Speed humps will be installed in 2019. MPOJC staff mailed surveys to 20 addresses located directly adjacent to the affected portion of Highland Avenue and received responses from 11 households: a 55% response rate. Of those responding, 9 households checked “yes” and 2 households checked “no” with regard to the proposed installation of speed humps: that is 81% of respondents in support of speed humps. Based on this response, a proposal to install speed humps will be forwarded to the City Council for consideration on October 2. Council voted unanimously to approve the installation of speed humps. Speed humps will be installed in spring 2019. The City installed two radar feedback signs along 7th Avenue between Glendale Road and Court Street, one for northbound traffic and one for southbound traffic. The signs display the driver's speed and caution them to slow if they are speeding. Research indicates that feedback signs may be effective at lowering speeds, especially among drivers exceeding the speed limit by 10 MPH or more. Staff will re-evaluate speeds 6 and 12 months after installation to measure their effect on speeds. Staff recommend that signs be removed if they do not produce a substantial sustained reduction in speeds or if maintenance and reliability becomes an issue. No additional installations of radar feedback signs will be considered elsewhere until after the end of the 12-month study period is complete. In 2018, speed humps were installed at four locations along Friendship Street, between Court Street and Brookside Drive. 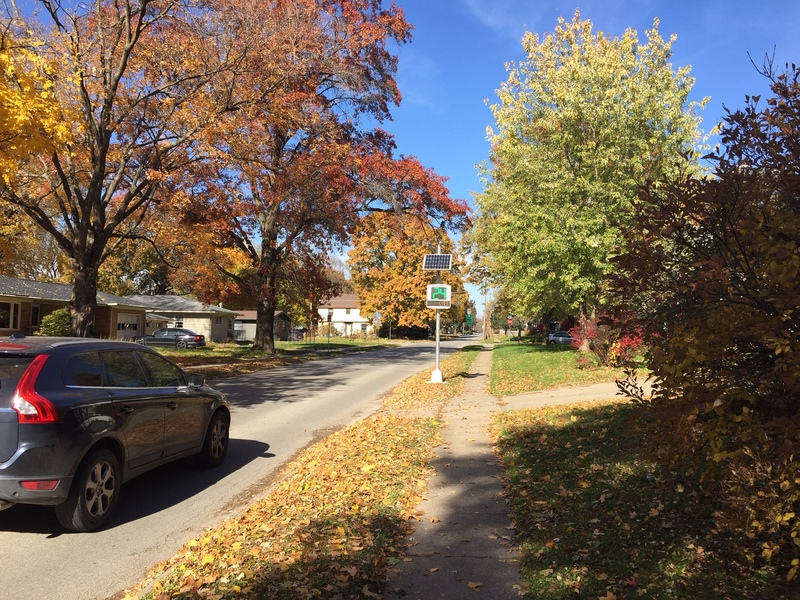 For questions about Iowa City’s Neighborhood Traffic Calming Program, contact Assistant Transportation Planner Sarah Walz at 319- 356-5239 or sarah-walz@iowa-city.org.